YYYESCABLE was established and located in Taiwan in 1982.It is rooted in telecommunication hook-up trade,grew up and became stronger from wire harness assembly and technology service. With the change of global economic structure, YYYESCABLE purchased the land and established our company in China Dongguan and Jiangxi. Under the guideline of striving for our cause,doing professionally and bringing forth new ideas, our marketing-supply has been adjusted. YYYESCABLE keeps the same steps among the same trade, and even overstep the others in game machine cables, computer cables, networking cables and automotive wires. In USB,1394 and other transmit interface, YYYESCABLE keeps up the same steps with technology development. 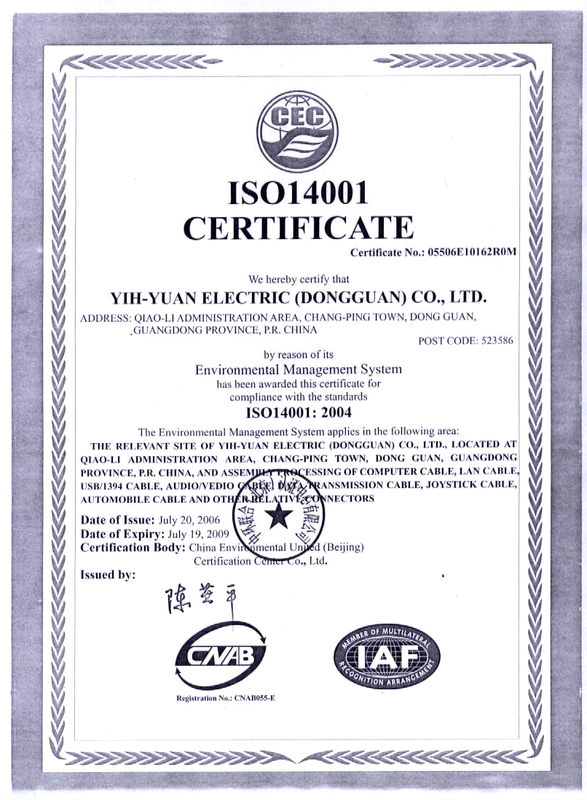 GB/T24001-2400 idt ISO14001:2004 Quality Certificate waw approved. GB/T24001-2400 idt ISO9001:2000 Quality Certificate waw approved. YIH-YUAN ELECTRIC CO.,LTD. was established and located at Jiangxi Branch,China. ISO 9001 Quality Certificate was approved. 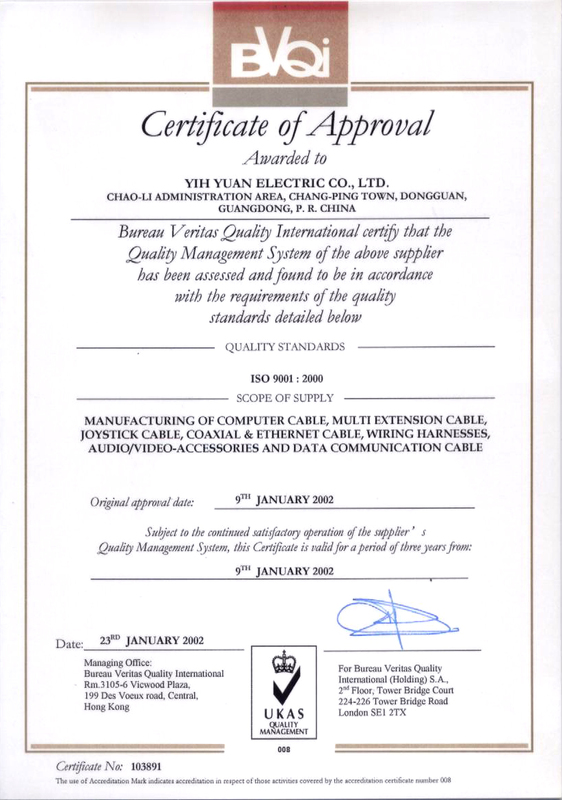 ISO9002 Quality Certificate was approved. YIH-YUAN ELECTRIC(DONGGUAN) CO.,LTD. was established and located at Chang-pin,Dongguan Guangdong Province,China. YIH-YUAN ELECTRIC CO.,LTD.was established and located at Taipei county,Taiwan. YYYESCABLE places great importance on environmental protection.